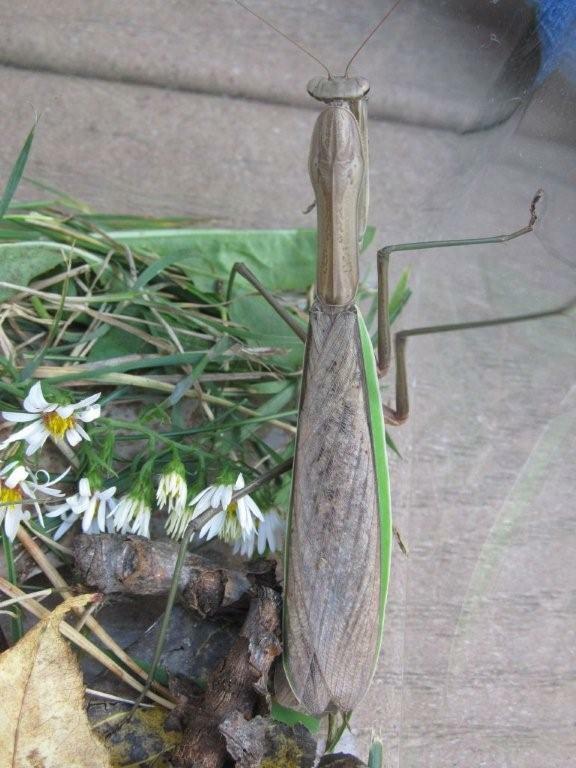 We took a walk not too long ago and the kids found this guy hanging out in the grass. Emilia brought him home and made a little sanctuary for him. We found out (from the good old web) that they like to eat other critters...pretty much anything they can catch. I watched a gross video of one eating a mouse. 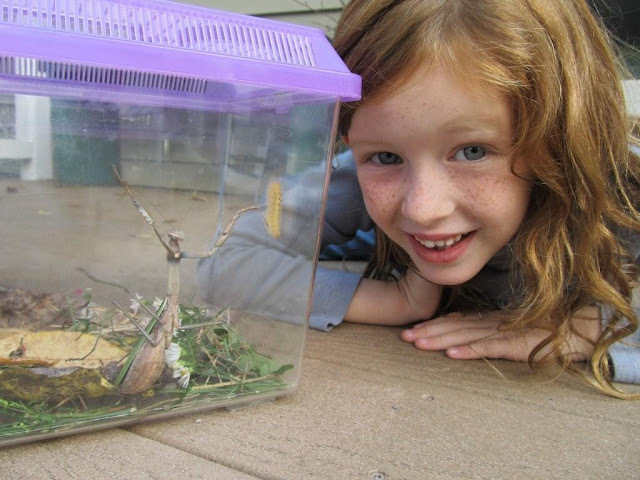 Fortunately, we were fresh out of mice, so the kids found a spider, an ant, and a yellow fuzzy caterpillar. "Manti" wanted nothing to do with the food the kids provided, so we had to be content watching his sweet alien-like head-moving abilities. 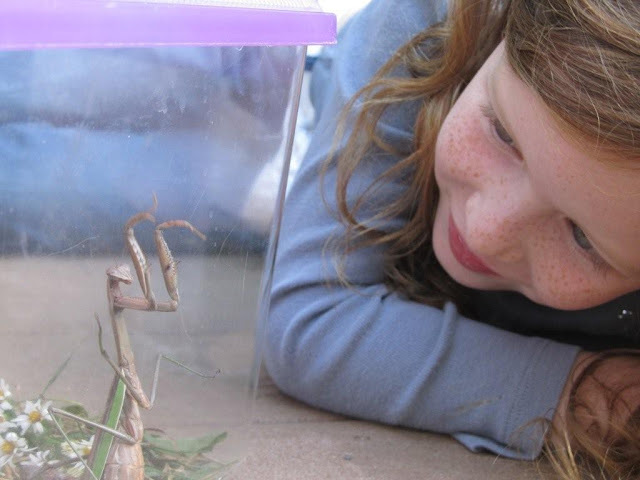 We'd never encountered a praying mantis, so we spent quite awhile just staring. God's creation is incredible! We had our fun and then the next morning Emilia released him. The kids had a mantis for a bit. 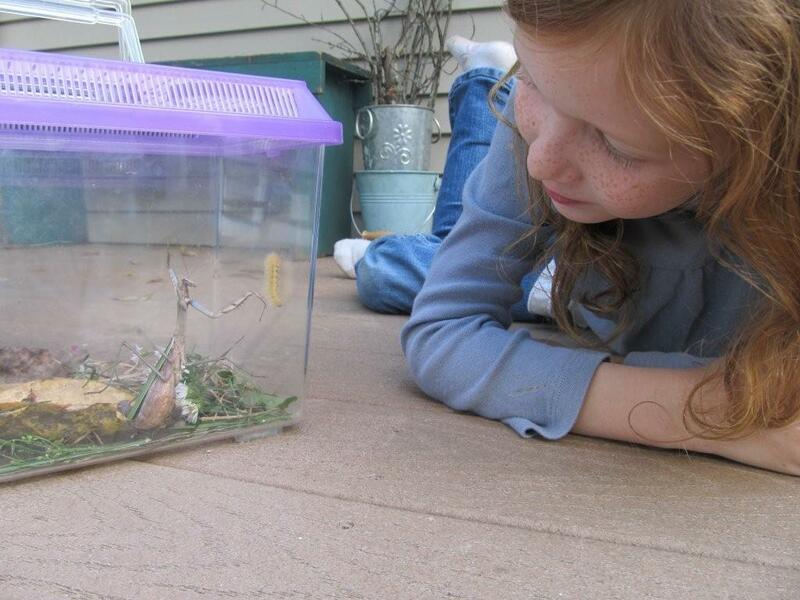 Grandpa said they make good pets, he'd had them in the classroom. It liked crickets. When it got too cold to find them outside I was driving out to buy crickets! Told myself I was a good mom: going out to buy bugs for a bug!! Unfortunately, I bought too big crickets (trying to be frugal & not have to buy as many) and one ate Manti's leg. Or at least that's what we think happened. He now rests in the back yard with all the other critters the boys have had. That is a HUGE one! Wow. Kate: It is huge isn't it?! I'd never seen one in real life, so I was very surprised at the size! Aunt Denise: My mom was telling me about how Uncle G. had one growing up and it bit him? That's very kind of you to fetch crickets. :) Hilarious about the missing leg!! Did the mantis ever eat the large crickets? Uncle G. says he doesn't remember being bitten. 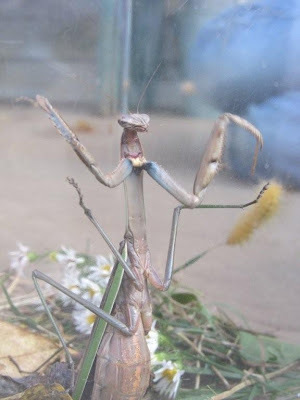 And, yes, the mantis did eat some of the crickets. It preferred the smaller ones though. I remember catching them when I was little, so it's neat to find them here and have the kids watch them. We have sooo many here in NC! All different sizes!